We all know what it feels like constantly replacing bakery items because they go bad too quick – it accumulates cost while simultaneously requires repeated visits to the supermarket. Instead, here’s a cost-effective way of making your bread last longer and eliminate the horrors of retro-gradation – the best bread box! By keeping out condensation and allowing the optimal amount of airflow, it keeps your bakeries soft and mold-free hence preserves the taste longer – bread, bagels, buns, cookies, you name your dough-based preference! Meanwhile, your freshly bought bread will no longer be a toy for your child or pet to experiment and play with! Therefore, bread storage boxes are the best way to store bread! What is the best bread box to buy? Q. Can I put other bakery items? Q. What material should I get? Q. How long does it extend the life of bread? With a 4.5 rating on Amazon, it is certain that Brabantia successfully lived up to its consumer demands! Built with a durable, corrosion-free material and a smudge-proof surface, this box cleverly hides the impact of heavy usage – not only does it leave it looking neat, it saves you clean time! The silver and black combination is a further elegant touch contrasting traditional designs thus promoting an attractive and grand countertop decoration. Additionally, a magnetic snap is included to ensure proper storage of your fresh-made bakeries. The hefty $100 tag pays you back generously with exceptional, quality service – the thick, sturdy tank-like construction ultimately makes up for the expensiveness by eliminating the need to replace your box that usually becomes the issue with cheap imitations! Combining a vintage and modern design, the Wesco Grandy bread box is handsome and impeccably suits most interior decor while providing sufficient room to store at least three full loaves at a time. It is thus of no surprise that 95% of its Amazon users are incredibly satisfied and impressed with what Wesco has to offer! Buying a bread bin and realizing it doesn’t store well or enough will only disappoint you in the long run and might not be any better than not owning a box. Thus to ensure promising service and reliable preservation of bread according to your personal preferences, it is vital to consider these few points. Climate plays a significant role when choosing breadboxes. The chosen material of the box highly depends on the humidity and temperature of the place you live in. While steel reflects heat well, wood absorbs moist. Hence, choose a box that functions under your climate conditions. It is important to take into account the space you have in your kitchen or wherever you desire to ensure that adding a bread bin would not leave the place looking cluttered. The size of the box determines the amount of bread or bakery you can store within it. Consider the number of people in your family and your average bread consumption to find an ideal size. It is vital to note how well the box closes. A flimsy closure will demolish the benefits of breadboxes by allowing access to bugs and too much air that speeds up the staling process. Bread bins can be found in a variety of materials. The box material includes ceramic, enamel, steel and wood, plastic. You can find bread storage boxes starting from as little as $10 and going beyond $100. Consider your budget hence begin your search to find a top quality box within that price range. Find a box that complements your decor and enhances the overall look instead of a clumsy design that ruins the aesthetic appeal of your kitchen. Over time, your bread storage box will be filled with tiny breadcrumbs and for that reason, consider a box that is easy to clean and maintain. The first and foremost benefit of getting a breadbox is its ability keep the bread from quick staling. By keeping the bakeries from direct sunlight and heat, it reduces the staling process. Meanwhile, the bread bin comes with ventilators that allow airflow to minimize condensation hence prevents molding. Leaving bread on countertops is an unpleasing site itself but it also leads to breadcrumbs scattered around which makes it far worse. Thus the best bread bin solves that problem by hiding your bread and crumbs in classy enclosures. Most boxes are beautifully designed to suit and enhance kitchen interiors. Being tightly sealed from the outside, bugs find it impossible to chew through to reach the bread like it does with plastic wrappers. A. Yes. Bread bins are spacious units that allow storage of any baked goods. On the contrary, a lot of households also use it to store other items such as kitchen tools etc. A. There is no one breadbox material that you should opt for. While the material is one of the considerations, there are many more things that play a part when choosing the high-quality box for you. Each material has its own properties such as – ceramic breadbox offers a traditional look, enamel bread boxes are durable, steel breadboxes are some of the most elegant and modern boxes and seals well and wood boxes are easy to clean. Thus, the material choice entirely depends on personal preferences. A. Usually, processed bread lasts 5-7 days anyway, however, homemade bread goes for about a day. With bread storage boxes though, fresh baked goods can have a life expectancy of 2-3 days. The sleek, modern bread container box with a fingerprint-proof technology is a perfect addition to suit any kitchen décor. The rectangular model also conveniently fits in any space and allows storing containers and other kitchen trinkets on top of it. Meanwhile, a magnetic closure safely seals the contents placed inside. Wesco Grandy brings bread fanatics the ultimate bread storing box and the only one they need – the spacious design offers ample of storage capacity and round edges suitably take the shape of your loaf of bread. Meanwhile, ventilation holes at the back ensure sufficient airflow to keep bread fresh at all times. An ingenious expandable technology only takes up the space that is needed according to what all you’re putting in it and the counter you are going to place it on. Although that isn’t the only interesting feature – Prep Solutions also allows its users to adjust the airflow inside the container to tailor to changing humid conditions. The stylish, bread storage box labeled with “bread” is an aesthetic, an adorable addition to any kitchen. Rounded edges create a retro appeal while the funky colors such as the Tiffany blue can trick you into thinking it’s an accessory. Being built with stainless steel, it also ensures proper care for your bread and fights off any water or smell from reaching the contents. Brabantia roll top bread box is a cheaper alternative to their expensive fall front design although offers you the same level of high-quality service. It is also designed with a similar color scheme – the classy matte steel excellently stands out. Additionally, it is also cleverly made with a noise dampening mechanism and allows satisfactory airflow and ventilation. If you’re looking for an antique collector item, Mountain Woods is the way to go! The Acacia wood is grown keeping environmental factors in mind to ensure sustainability meanwhile it is beautifully crafted to create the perfect essence of a modern French bread storing box. A magnetic-flip-down lid contributes to easy access to your bread. Another of Mountain Woods’ breadbox that conveys promising storage of bakery items. This Wooden bread box is constructed by skilled workers that perform environmentally friendly forestry practices and bring out innovative designs – a thin outer surface contributes to the box’s breathability and extends the freshness of baked goods while also eliminating the chance of the wood to crack. While similarly designed as the Brabantia roll top bread box with the same opening mechanism, Home-it offers its users a much cheaper alternative! The attractive tag is combined with a reliable service by preserving the taste longer and allows the least absorption of water and smell. Retro and compact are two words that perfectly describe this ivory themed bread storing box. The exterior is smooth and gives off a lustrous shine and the size is suitable for smaller kitchens however capacious enough to hold and a full loaf of bread. With an aesthetic black color, this plastic bread box is certain to promote elegance wherever it is placed! Rear air vents, on the other hand, allow maximum air circulation for proper preservation. Moreover, a genius protective plastic trim ideally prevents countertop scratches. Hence the end of the bread storage box reviews. Storing bread may not seem to be a priority for you but it has far too many benefits to ignore. As it keeps your bread fresh and bug-free, concurrently, it keeps you away from transmitted germs from bugs and allows you to enjoy your tea time or breakfast with bread that is soft and delicious. Throw in your bread in one of the breadboxes that we have mentioned in this article and forget worrying about it going bad anytime soon! 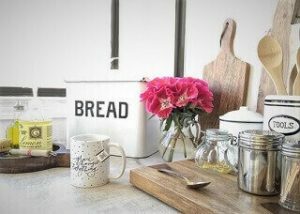 While supermarket bread is already processed in a way to last you longer, homemade baked goods will not last you more than a day – but with a bread bin, IT DOES! A personal favorite is the Brabantia Fall Front Bread Box. I believe that this model by Brabantia is the best bread box for homemade bread! Functionality, exquisiteness, and effectiveness are inevitable with this box – just like the reputable Martha Stewert bread box. Brabantia is also a trusted manufacturer that serves customers with quality products and one that takes social responsibilities seriously thus practices environmentally friendly production methods – certified by the EPA. 15 Must Know Facial Steaming Benefits & Why You Should Use Them?